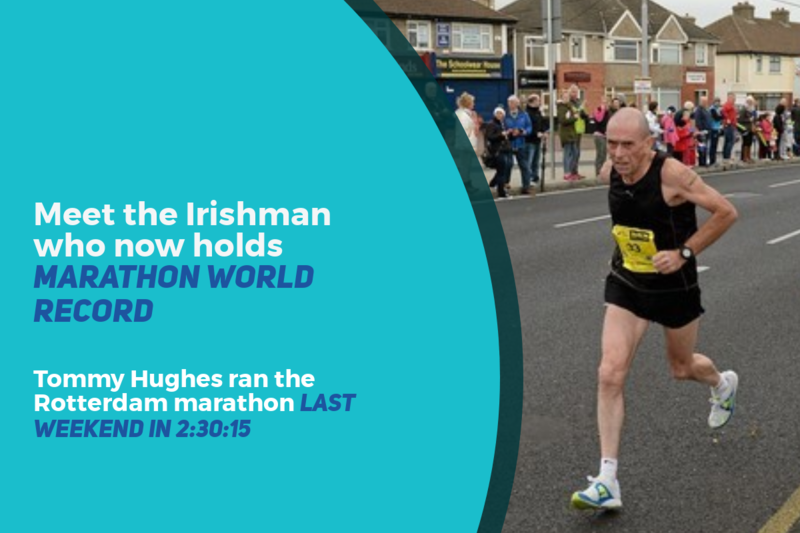 The outstanding Irish sporting achievement of last weekend - and perhaps all of 2019 - took place in the Netherlands when 59-year-old Irish runner Tommy Hughes ran 2.30.15 in the Rotterdam marathon. Hughes finished 68th overall. It was the fastest marathon ever run by an Irishman over 55 and the world record for a 59-year-old. Hughes is from Derry and runs with Termoneeny RC. He represented Ireland in the marathon in the 1992 Olympics in Barcelona. He won the Dublin marathon in 1991, running 2:14:46. But it is what Hughes is achieving in his late 50s that is proving to be career-defining. In fact, a few years ago, Hughes thought his days as an elite runner might be over, as he was slowed by fatigue and depression and turned to alcohol to cope. But after a doctor diagnosed a parathyroid issue and help him find a way to treat it, Hughes has arguably hit the form of his life. He has cut eight minutes off his marathon time since December and is now eyeing a number of other world records when he turns 60 next January. We spoke to Hughes about how he trains, how he’s sustained elite marathon performance over four decades and what other milestones he is aspiring to. Can you tell us how you broke the Irish and world record? I’d been going for the 55+ marathon record because I hold the Irish 50+ record in the half marathon and the 10k. I’d been slowed down by a condition that required an operation, I began to train seriously for the Irish record. The record at that stage was 2.41. Then at Dublin last year, Cathal O’Connell set the new record of 2.37. I had a go of it at Malaga in December and ran around 2.38, just about 50 seconds slower. I decided then I’d train a bit harder in the springtime for a fast course like Rotterdam or London. I trained really hard over six months. I knew I was going well because I broke the Irish 50+ record in the 10k and the half marathon in the buildup to the marathon. It was an issue of getting it right on the day. I did 2:30.15. I found out after it was the world record for 59-year-olds. It was a nice bonus! How did this medical condition slow you down? I never lost the love of running. I broke some records when I was 50 but then something happened to my body. I struggled with my fitness because I had a medical condition and I needed an operation last August. There was too much calcium in my bloodstream. It was poisoning me. I got a bloodtest for another reason and found out this had been ailing me. I struggled and struggled with fatigue and depression. When I got this sorted, it opened the door for me again. I didn’t know there was anything wrong with me. I just thought I was getting old. I was struggling with fatigue. I was getting depressed. I was turning to drink, Those binges were killing me as well, they’d go on for 2 or 3 weeks at a time. Everything was falling apart really until I got the diagnosis about the parathyroid. What sort of training were you doing to hit 2.30 in Rotterdam? I’ve always trained on my own, even when I was preparing for Barcelona, I always trained on my own. I know what to do. I know how to listen to my body. My typical training week for Rotterdam would have been running 16 miles on a Saturday, then 22 miles on a Sunday, then on a Monday a 5 mile in the morning and a 10 mile in the evening. And then speed training during the week, fartleks, and also some speed work. My body finds it very very quick to recover. Even before the marathon, I ran a 5k on the Wednesday in Belfast in 16.51. How has marathon running changed for you since your 20s? It’s chalk and cheese, I ran 2.13.59 to win in Dublin in 1991. I find having targets is quite helpful in staying motivated . I turn 60 next January. The over 60 wordl record is 2:36.30. But there’s other goals that I’m training for. I’ll be 60 next year. I know many people have run under 2:30 in four decades, but if I do under 2:30, I’ll have done it in five decades. I don’t think anyone has ever done that. It’s all about enjoying it. Eat the right foods. Get the rest. And overall be happy. It’s about being consistent and not putting too much pressure on your body. If your body hasn’t recovered, don’t run. If I’m pushing my body and if my body says no, I stop. When I got training most of the time, I got out at three quarters pace. It’s not all out. And the body gets used to that. And the next time you go out, your next three quarters will be faster in three or four weeks. And then you’re just becoming a machine. You do it and you do it and you do it and you gain fluidity. That’s the thing about the marathon. It’s a totally different event than any other distance. Everyone can train up to race up to a half marathon, but the step up to the marathon, those last six-to-eight miles, nobody can really train for it at a real hard pace. For this last marathon, I did two training runs of 26.2 miles, so I’ve done 2 marathons leading up to this marathon in training. They weren’t flat out. I was just getting the distance in my legs and getting used to it. And in those last six miles, that’s where I notice it in my legs. Like I was catching people, young people, who went out too hard. I was catching them because I knew I had the distance in my legs. I find the mental side gets easier as I get older. If I’ve done the training, I know in those last two miles that I’ll get there. I’m going to keep training and I’m going to keep racing. My son is going well in the marathon and we’re going to train for the father-son world record. I’ve done over 100 marathons, I used to run 4-5 every year. I need to have targets to aim for. I’m not a real fan of training. But I’m a huge fan of racing. It’s a great feeling to be fit and to be out on the street racing.